Springtime memories. Do you have some? I do. Today, as I took a walk, I did a little remembering. 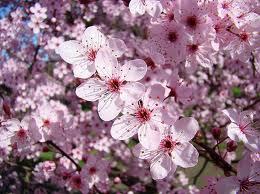 The new grass, the trees loaded with blossoms, and the warmth of the sun reminded me of a similar day sixteen years ago. But that day, I didn't walk. It had been six weeks. Six long weeks. Six weeks of complete bedrest. Six weeks to save a baby girl, still unnamed. Day after day, from my station on the couch, I could see only the lilac bush through the dining room window. Every day, hopeful leaves pushed out a little bit more. Every day, I prayed for the little life growing inside me. Psalm 139 became my constant companion. It seemed our baby said, "I will praise You, for I am fearfully and wonderfully made . . . "
Finally, the day came for me to get up, to have another ultrasound, to see the doctor. I gingerly found my way into the car. All the way there and all the way back, I could hardly believe the transformation that had taken place since that bleak day in March when doctor's orders took me off my feet. Trees in bloom boasted a myriad of color. 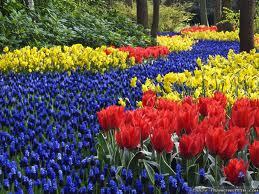 Tulips, hyacinths, and daffodils nodded their pretty heads in the warm breeze. Forsythia and azaleas lit up the landscape. The air smelled fragrant and sweet. The grass . . . could it grow any greener? The sun sent its healing rays deep into my soul. I couldn't get enough of spring's fashion statement. On the way home, my husband drove me up and down the side streets. Tears slipped down my cheeks. After the drama of a surprise baby almost lost, the beauty of new life gave me hope. All these years later, I still remember that day. I also remember the midnight feedings, the times I rocked her and sang, the coloring pages, the play dough, the first and last days of school, the books we've read together, the piano recitals, the track events, the funny things, the tears, the vacations at the beach, the hugs, the long talks, the shopping . . and the countless blessings that little girl, now fifteen, has brought to our family. Precious memories. All of them. Perhaps it's time to take a walk. To think back. Any springtime memories come to mind? I was pregnant at this time 20 years ago with a baby girl we never thought we would have. I was 38. We had never gotten pregnant before and I was beyond excited and terrified. All those things you listed are all the memories I look back on...wishing it all could have lasted a little longer. Wonderful, surprise babies...blessing our lives abundantly. Thank you for sharing your story! I was 38, too. Even though we had two precious daughters (teenagers), I still found myself "excited and terrified" at the same time. Blessings to you as you enjoy this stage of parenting. This brings to mind a spring day in 2005 when I heard my baby's heartbeat for the very first time--when I was about six weeks along in pregnancy. New Life! Nothing else had ever seemed so amazing. Thanks, Sherry, for sharing. I don't think a mother ever gets over those sacred "new life" moments, do you?! And then we do it all over again, though in a different way, when our children are expecting their babies!! A lovely springtime memory! Happy birthday, Elizabeth. Thanks, Jo Ann. Memories have a way of gracing the present in a warm sort of way. Perhaps they make us more grateful . . .